[Free Pattern] The Cutest Baby Booties Ever. Ahhh So Cute! 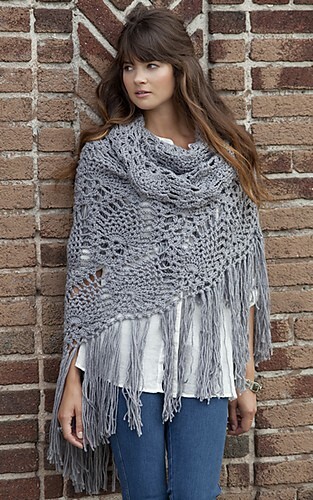 This shawl is a real work of art! Truly amazing piece! The Sidewalk Shawl by Kimberly K. McAlindin may look intimidating; in fact the pattern turns out to be easy and enjoyable. 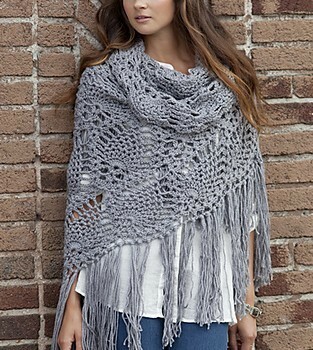 The beauty of having a shawl is that can be worn all year round. Shawl measures 77” wide (across top edge) x 34” long (not including fringe). GAUGE: 1 pattern repeat = 9½”; 6 rows = 4”. Notes: One pattern repeat consists of a pineapple pattern at its widest and the surrounding ch-spaces and shells. Visit the Next Page link below for the VIDEO instructions. This is not a free pattern. Not free but it is beautiful. I just checked and I can’t find where it is free.. Sorry Libby, this pattern was free a couple of hours ago when the article was written. It’s a paid pattern now.